Magnets have been used in the medicinal field for the longest time. Could we use it to better our health and night's sleep too? Magnetic therapy has existed for over thousands of years as a form of alternative medical practice. Books like The Yellow Emperor’s Book of Internal Medicine dating back to 2000 B.C. already mentions this as a form of therapy to heal the body. The theory behind it is that our bodies are made of energies and magnetic fields. When a part of our body is in pain, there must be an energy imbalance behind it. Through the use of magnets, positive ions are concentrated on certain pain points. It is scientifically proven that the movement of ions is indeed affected by the presence of a magnet. However, no research has been done to see the magnets' effect on the ions of our body. Listed below are the claimed benefits of using stagnant magnets to the body. Due to the lack of research on magnet therapy, the use of magnets cannot guarantee all or any of these effects. In the end, the results may still vary from person to person. Magnetic Mattress Pads: Should You Buy Them? What are Magnetic Mattress Pads? The popularity of magnet therapy also brought forth magnetic products. From bracelets to slippers, all of these claims to bring the same benefits as that of magnetic therapy. The sleep industry also jumped on board with the creation of magnetic therapy mattresses, mattress toppers and pillow pads. Most are made of memory foam that comes in various bed sizes such as queen size or king size beds. Continuous strip magnets are found embedded in the foam and span the entire bed to cover the whole body. When looking at magnetic mattress overlays, it is important to check their gauss strength. Gauss is the unit of measurement referring to the strength of the magnet. Only strong magnets will be able to penetrate our skin and have effects on our body. READ: What Is A Mattress Topper and Do I Need One? Since there is a lack of scientific research on magnetic therapy and its magnetic product derivatives, the decision is ultimately based on customer reviews and testimonials. 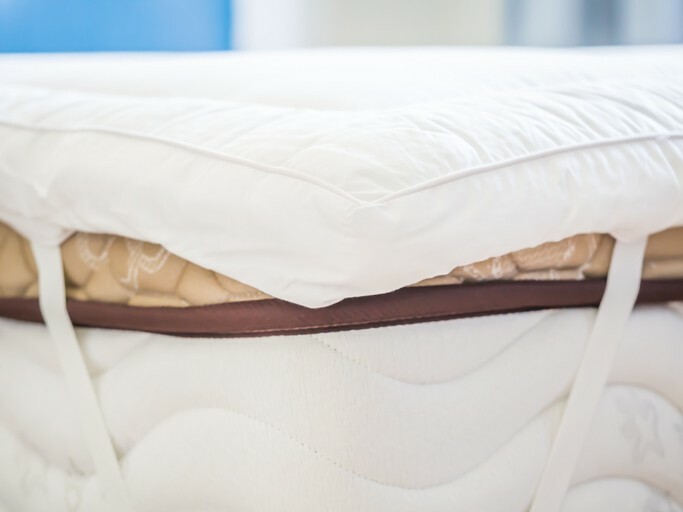 Some who used the magnetic mattress topper can feel its listed benefits while others may not. As mentioned, its effects vary from person to person. NOTE: A higher gauss rating also comes with a bigger price tag. With the additional price to pay and the uncertain benefits, going for a magnetic mattress topper might not be the most cost-effective option. If spinal pain relief and better sleep is the desired effect from the magnetic mattress pad, purchasing a memory foam topper would work just as well.